Metal racking: What finish offers greater protection against corrosion? 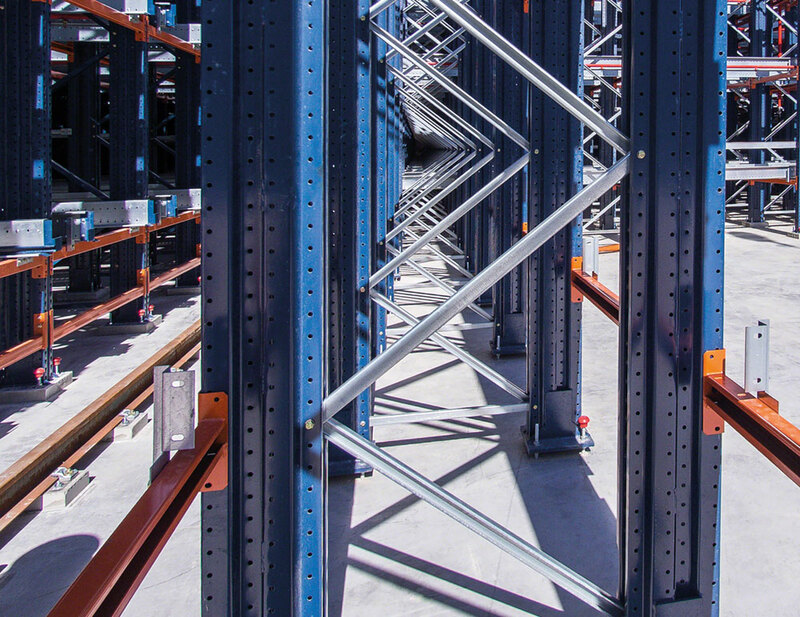 In warehouses, racks are exposed to changes in temperature, humidity, continuous transport of goods and operators. These factors can cause deterioration of the components that make up the structures. This article analyses the advantages and disadvantages of the different methods and finishes available on the market to protect the metal profiles from the effects of corrosion and oxidation. What systems can be applied against corrosion? The components that are part of the racking should be protected against oxidation. Scratches or lack of continuity in the coating generate more vulnerabilities. For this reason, both the type of finish employed and the pre-treatment applied are very important, which act as a second barrier protection against corrosion. Galvanised consists of covering the metal with zinc to protect and insulate it from corrosion. Painted profiles are coated with a paint that acts as a physical barrier against the onslaught of oxidising environments, thanks to the anti-corrosive effect of the pigments and resins used. Below, the article examines the main advantages and disadvantages of these protection systems for metal components. The finish of pre-galvanised elements is procured by the immersion of the steel coil in a bath of molten zinc in a continuous process. It is an operation carried out by the steel manufacturers themselves. It creates a coating with a thickness of between 14 and 19 µm. The galvanisation process is perfectly controlled by the steel company and does not require intermediate stages for the racking manufacturer. Perfect cleaning and preparation of the base steel before galvanising. Heat treatment preparation of the base steel. Chemical passivation after galvanisation, by means of a chroming process. It is highly applicable for additional racking elements, mainly those made of thin sheet metal, and those which are subject to constant friction. The finish is different according to each manufacturer. 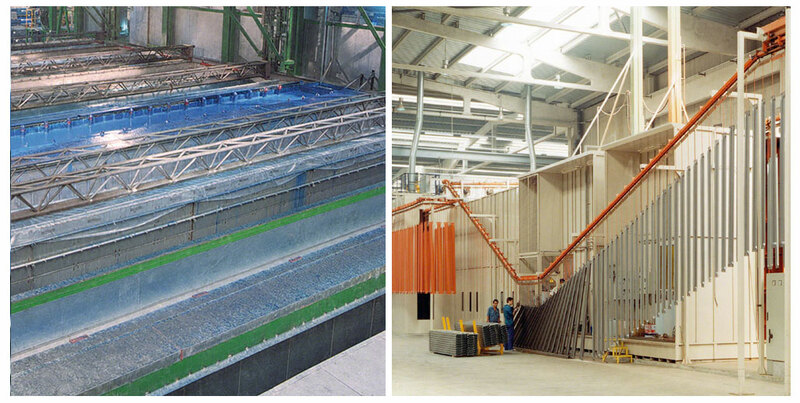 Availability of steel grades suitable for producing the racks is more restrictive than with ungalvanised steel. The visual appearance deteriorates over time and ends up looking old. Sheared and gashes are uncoated, and although this is visible, they are still protected by the adjacent zinc. The pieces require special contactless packaging, especially if stored outdoors, to prevent moisture from being retained, as it would reduce its strength. It is not resistant to some acids and chemicals. Hot galvanisation consists of introducing the piece, once made, in a receptacle of 450 °C molten zinc. A zinc layer is created with a thickness varying between 60 and 90 µm. This process ensures maximum protection of profiles and a very long, maintenance free product life. In general, their use is widespread in urban fittings and structures found outside (electric poles, signs, barriers). Being an immersion process, the entire piece is coated and its mechanical strength (against blows, impacts, abrasions, loading and unloading, etc.) is higher. It is a very complex and expensive process, needing large capacity facilities specifically prepared for this. Visually, it seems damaged, uneven and it worsens over time. Parts require special contactless packaging. They cannot be stored outside during the first days after manufacture. The behavior of zinc varies depending on the environment where it is found. In humid environments, it generates zinc salts which are highly hygroscopic and moisture absorbent. It is a snowball or loop effect: the wetter it is, the more salts are generated. Instead, in a dry environment the zinc is passivated; this means that a film forms on the metal surface which protects it against external factors. So the zinc becomes more resistant and stable, a constant exchange of wetting and drying cycles is needed, meaning this metal is optimal for outdoor use. Conversely, if the profiles are permanently in a humid environment, that is when the zinc salts appear, starting the oxidation and deterioration. The relative humidity of the frozen storage is, in theory, practically zero, only being found in the entrances and exits of the warehouse. That is why galvanised racking is a perfect fit. However, humidity is higher, even necessary, in cold storage. For this reason, the installation of galvanised racks in this kind of cold storage is a mistake: passivation will protect the entire structure for a few months, but once it loses its effectiveness, the zinc will decompose forming zinc salts and disappear. In fact, during tests in a salt fog chamber, it can be seen that the behaviour of hot-rolled galvanised material is much worse. By not being passivated, its deterioration occurs in under 100 hours and pre-galvanised sheet metal at around 150 hours. This test is applicable when determining the comparative anti-corrosive quality of various types of coatings. It is a procedure that distributes liquid or powder paint on parts for a double effect. On the one hand, the electrostatic attracts the sprayed paint until depositing it on the piece. And, secondly, the cinematic effect unleashes paint at high speeds. Phosphating of the surfaces. Phosphate coating is created with antioxidant elements, which protects against moisture and corrosion. Passivation. It is a treatment that creates a protection against the action of agents on the surface of the profiles and improves paint adhesion. Paint application. Paint particles are electrically charged and adhere to the piece through electrostatic and cinematic effect. Drying oven or polymerisation. It operates at a temperature of between 160 and 180 °C. In the polymerisation process, the resins from the paint itself form a continuous coating that includes the mineral pigments, providing colour and the antioxidant effect. Indeed, its application is very simple and requires less investment compared with other systems. An air transport chain is needed to hang the pieces, cabins to apply paint and a polimerisation oven. In smaller facilities, any stage of the process can be modified and re-purposed with ease, and the colour changed at any time. It is an optimal system for closed profiles or flat sheet metal with one or two folds. The anti-corrosive quality depends on the type of paint used, the preliminary procedure before painting and the thickness of the layer. However, the electrostatic painting has several disadvantages in open profiles. The paint does not reach the interior parts, nooks and corners with the same thickness, due to the Faraday effect. Consequently, the distribution is not uniform and there are always areas with less paint or that are unpainted. The coatings are electrical insulation. Physically, the differences in thicknesses on the distinct areas of the same piece produce potential variations and generate the passage of currents inside the piece (thus, facilitating corrosion). Furthermore, the fact of having a reduced thickness results in an inferior physical barrier against corrosion. This is an immersion process that allows the pieces to be coated with paint. It is performed by cathodic electro-deposition: the cations (positively charged ions generated by the dissociation of paint molecules), immersed in an aqueous solution, adhere to the profiles creating a uniform layer. Physical-chemical degreasing of hot-rolled parts. This removes grease, particles and other impurities present on the surface of the profiles. Creating a nano-technological conversion layer of zirconium fluoride on the steel. It is very compact and with few interstitial spaces. Its mission is to provide anti-corrosive protection, decreasing exposure of the base steel to the environment and, in turn, improve paint adhesion. Washing with deionised, demineralised water. It is necessary that the surface is clean and free of salts to facilitate maximum paint adhesion. Cataphoresis bath. In the immersion, the paint coats the entire piece, inside and outside. The profiles act as the cathode (negative pole) and the paint as the anode (positive pole). The interaction with an electric field between 240 and 300 V DC for about two minutes allows ion exchange between foreign molecules of the profile and the paint itself, ensuring greater strength through a thinner coating. Bathing of pieces with recirculated ultra-filter and afterwards on the exit ramp with a spray of new ultra-filter. Ultrafilter is a component that removes traces of badly adhered paint and creates a smooth, even surface. Polymerisation of the pieces in an oven at 180 °C for approximately 40 minutes. High anti-corrosive quality. The pieces withstand more than 550 hours of testing in a salt fog chamber; much longer than other systems and procedures. Total coating of the surface, including the inaccessible parts of the piece. Being an immersion process, in which the paint is constantly agitated, ensures proper painting. Parts are coated even in inaccessible inner corners for the electrostatic systems. Uniformity of the coating thickness. The cathodic electro-deposition process ensures the layer has a uniform thickness of 20 microns, which improves the anti-corrosive quality of the piece and protects the edges and points (very important with uprights and pieces with holes). Lower environmental impact. Solvents are not used and it does not contaminate. Use of epoxy resins. The paint is formulated with epoxy resins, which protect the most against corrosion, chemicals and acids, in addition to allowing optimum adhesion of subsequent layers of paint, if necessary. A perfect finish. This finish is more uniform than any galvanised material. Moreover, the surface is completely smooth and keeping a professional appearance for longer. The cataphoresis process requires a considerable and sustained expenditure. However, it goes without saying that the finish is superior and ensures greater safety in relation to the process of galvanisation and electrostatic painting. For over 30 years, Mecalux has applied this process to the uprights their racking frames consist of, due to their critical importance in any installation: they are subject to interior microclimates, in contact with the floor, bear heavy loads, can suffer blows, etc. 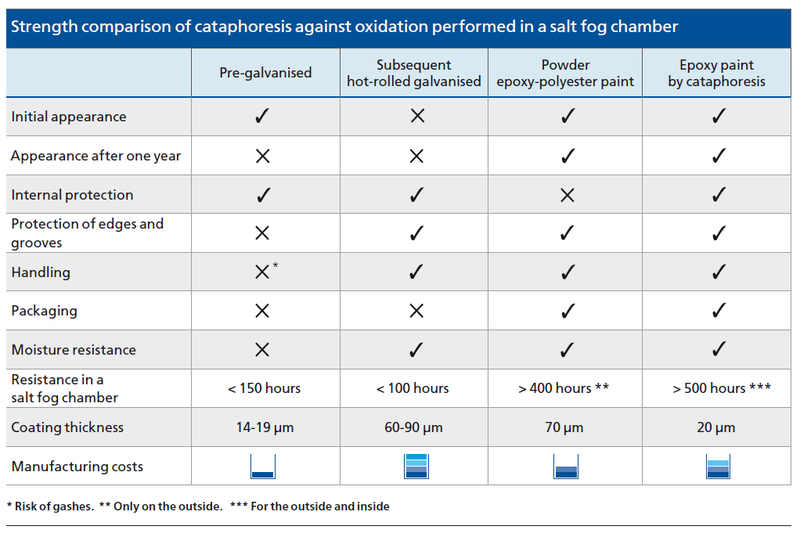 The anti-oxidation strength of cataphoresis is much higher than other finishes on the market, as can be seen in the comparative chart.